This photo shows the damage caused by the flying bomb on the 8th August 1944. W Gilmour was the shoe repairer. On the right hand side, the two girls stand outside the remains of the Forge. This site would now be in the middle of the High Street by the bus stop, at the eastern end of the village. 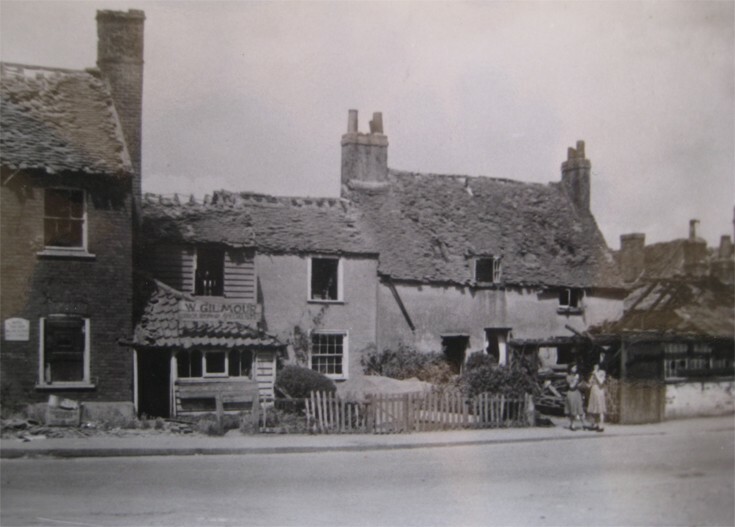 For lots of THEN and NOW photos visit the Banstead History Research Group website and look at our publications. The original photo was supplied by Mrs D Johnson. On the day the doodlebug landed, my mum was at work at the fire station when she was told to go home – she didn’t know what to expect. When she arrived at Salisbury Road the fire pumps had hoses all over the place, and her house seemed to be the first one on the Sutton Lane side of the road to have survived intact enough not to need demolishing. All the plaster had come down off the ceilings, but her main memory was that she laughed when she saw that the front door had come off and was leaning against the hedge at the end of the front garden, with the morning post (or possibly a newspaper) poked half way through the letter box. My father was in the Police (War Reserve/Special?) at the time and remembered the litter of playing cards strewn over the road having been blown up in the Police 'canteen' that was behind the Smithy. I love your mother's sense of humour, Barry! My brother and I had been evacuated to Chorley, Lancs, at the time the doodlebug fell. My mother was taking refuge in the communal shelter at the recreation ground in Avenue Road. (A photograph was recently added, so thanks for that.) Our house in Sandersfield Road was damaged by the blast, but not too seriously. A young friend and I (we were aged about 8) loved playing on the piles of rubble that were left at the top of Buff Avenue. I cut my foot very badly, and was taken to the Sutton and Cheam Hospital in Belmont. (I can't remember who took me - no ambulances for such 'minor' injuries in those days!) To this day, I have a very impressive scar. My Dad was in the Banstead Fire Service and remembers when the Woolpack got hit and the land lady climbed out of the rubble still clutching her glass!! The Woolpack opposite the V1 Doodlebug site was the place I chose to propose to my girl friend Joan,in 1953. We'd got the 164 from Rose Hill, StHelier, we alighted at the Shelvers Way request stop. Walking through the edge of the woods, we doubled-back towards the Village(it was dark now, being early October- and through the Recreation Ground. A couple of steps up,through the front door of the Woolpack and we were facing the bar. I ordered sandwiches (ham carved off-the-bone), half pint of shandy for me and a Babycham for Joan. We went into the adjacent, floodlit garden where, at a metal table and folding chairs, I proposed to Joan- and she accepted. How romantic and lavish can you get..?! I was talking to my sister earlier who is currently working on our family tree. And is trying to find out more about our father's side of the family. He was born in Balham and we know at some point he moved to the Banstead area and his father was a master cobbler. His father was William Gilmour, sadly I never met him as he died in 1954 the year before I was born. My father was Henry and helped in the shoe repair shop and quite a character. I know it's a long shot but if anyone has any memories of our family. We would love to hear. Reply from LNW: I will check my postcard collection and see if I can find a better view of the shop, assuming you have not got one. We have a few members who may have memories of the place and I will see what I can find out.